A reader wrote in to ask about calibrating images to get to 1:1 for shoe prints. Regardless of the purpose, shoe prints or latent prints, calibrating your images in Photoshop CS4 works the same. George Reis's book, Photoshop CS3 for Forensic Professionals, devotes an entire section to this subject, so I won't go into redundant detail. In the example sent to me, the image needed to be adjusted on both the horizontal and vertical axis to start. After the adjustment is performed, using Lens Correction, you can check your work using the Ruler and the Measurement log. 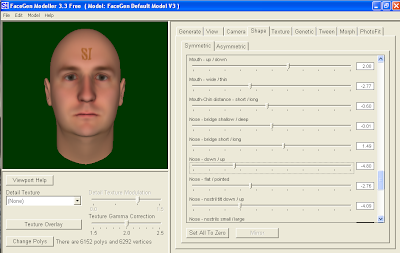 You can then use the results to calibrate your image using the Image Size dialog. Remember to uncheck the Resample Image check box. Use the Forensic Photoshop Configurator Panel to help correct the image's focus, colour / light, and sharpness. Use Ruler / Measurement log to establish scale. Verify the horizontal and vertical alignments are within tolerances. Save these to the Measurement log. 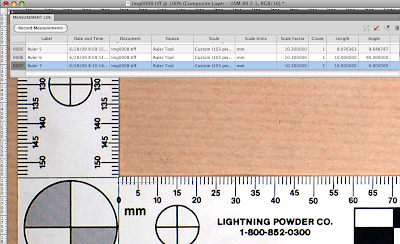 Take the horizontal dimension of the image with the Ruler / Measurement log. Calibrate the image (Image Size) with the measurements taken. 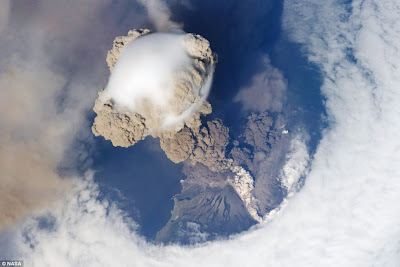 The folks on the International Space Station happened to record an eruption of Sarychev Peak, in the Kuril Island chain. Atmospheric haze, dust, and ... gets in the way of this stunning image of nature. With the help of Photoshop CS4, and the Forensic Photoshop Configurator panel, the haze and dust is gone and the image's details are revealed in amazing clarity. Check out the original photos from NASA and share in the amazing view from the ISS. Where do I find the Gradient Tool, was a question recently posed. If you are still getting familiar with where things are in the Photoshop interface, look in the Tool bar - see the tiny triangles at the bottom of some of the tool's buttons. Click and hold on the button and you'll see the options fly out at you. Looking for the Gradient Tool? You'll find it under the Paint Bucket Tool, and so on. Don't be afraid to click around the interface ... it's half the fun. All sorts of traits and behaviours can identify an individual. Sometimes, we can't get a good enough facial image from a video ... but we can combine the video that we have with fingerprints, DNA, and so forth. There are many biometric identifiers to choose from, so more obvious than others. Did you know that Keystroke Dynamics uses the cadence of an individual's typing pattern for recognition. It's not necessarily what you've typed, but how you've typed that's the key. Do you hunt and peck? Do you use two fingers and a thumb on each hand. Do you use one hand more than others? All of these clues add up to who you are as a typist, help to separate you from the rest of the population, and help to positively ID you. If you are moving from older versions of MS Office into their latest, MS Office 2007 (PC), and are wondering where everything went, don't worry. It's all still there. Click here to download Microsoft's guides to the 2007 Office system. The toolbar is not the toolbar anymore. It's now called the Ribbon. Microsoft has several Ribbon Mapping workbooks available to help you transition to the new (ish) software. Before you say it, yes I know ... it's 2009. However, many government agencies are still on Office 2003 and are just now moving to 2007 (or plan to do so in the next fiscal year). Moving an entire agency to a new version of software is a lot more complicated than you might think, both technologically and politically. More cameras = less crime? Another city has blanketed neighbourhoods with cameras. This one has an interesting twist on funding and operational support. Click here to read this story from the LA Times. A new feature in iPhone OS3 allows for a remote wipe of the phone's contents. Additionally, MobileMe accounts allow the phone to be located on a map if the phone has been lost or stolen. In terms of operational security or forensic exams, you'll need to be a bit more careful when you are working with phones enabled by the new iPhone OS. How long will XP live? Microsoft has gone public with a piece of its Windows 7 to XP downgrade guarantee that it refused to make official until yesterday: The end date. Volume licensees who buy Windows are provided automatically with guaranteed downgrade rights to previous versions of Windows. A Windows 7 volume licensee has the right to downgrade to Vista, Windows XP or other previous versions of Windows, according to Microsoft’s policies. Earlier this year, Microsoft officials refused to confirm a report which claimed that the company planned to limit the length of time it would allow users to downgrade from Windows 7 to XP to six months after Windows 7 shipped. The leaked memo pegged that date at April 2010, which both Microsoft and Hewlett-Packard (the OEM mentioned in the memo) declined to confirm. On June 17, however, Microsoft officials told Computerworld that the downgrade period during which users will be allowed to move from Windows 7 to XP is going to end, at the latest, in April 2011, which is 18 months after the October 22, 2009 general availability date for Windows 7. I came across an interesting tool for generating facial images. FaceGen from Singular Inversions is an easy way to generate 3D faces. 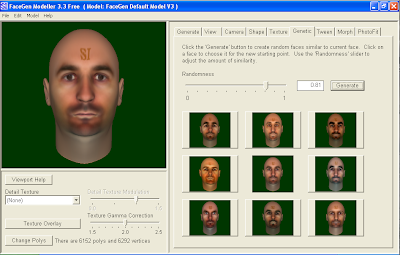 You can start with a randomly generated face, or if you know gender, age, and race, you can get a little more specific with your starting point. You can adjust facial hair, colouration, and an incredible amount of specific details. You can even bounce your creation off of a randomly generated set of sample images. You keep fine tuning your image with a maddening number of tabs and sliders. I think that you'll like playing with this unique program. The full functioning demo is free, but it puts the SI watermark on the forehead. The license fee is cheap at $299. It's Windows only, but it runs fine in a virtual environment. It does rely heavily on the GPU, so if you're not running on a dedicated GPU, it may run a bit slow. Q: What is the difference between biometrics and forensics? While both biometrics and forensics involve human recognition, biometrics is typically applied using automated techniques to the pre-event situation application, such as gaining access to sensitive information or to a secured facility. Forensic applications typically occur after a crime has occurred, and may not use fully automated methods. Forensic methods are often used to assist in the adjudication (legal) process. Forensics usually requires days of processing (versus seconds for biometrics) and are held to much higher accuracy requirements. I just received word that the Forensic Photoshop Blog was listed in the top 50 Forensic Science Blogs at Forensicsciencetechnician.org. Pretty cool. Before you install Snow Leopard (OS 10.6) on your Mac, take note ... one of the "refinements" is a change in gamma. The gamma has been changed from 1.8 to 2.2. Says Apple, "the default gamma has been changed from 1.8 to 2.2 to better serve the color needs of digital content producers and consumers." Snow Leopard also features an update to QuickTime, QuickTime X, which includes screen capture capabilities, improved colour accuracy, and GPU-acceleration. I doubt that I have ever read a more poorly written User Guide in my life, including the ones written in another language and translated badly into English. The only thing that comes to mind is that the company, Guidance Software, is trying to drive people to its classes. Wow! I would have been happier with a tri-folded insert card outlining the interface and installation procedure ... with the flip side giving the company's contact info and class pricing. At least this way, it would be obvious that they want you in class. That being said, I found a book that should have been included in the box, the Official EnCase Certified Examiner Study Guide by Steve Bunting (an EnCase Certified Examiner). Steve gives a nice opening treatment on the fundamentals of computers, then moves into using the program. While it's not a user's guide, it's pretty darn close (and 100% better than what Guidance produces). There's a lot of cross-over between DVR imaging and forensics and computer forensics. Many video and image pros will find themselves trying to learn more about computer forensics ... so I thought I'd spare everyone the frustration and send y'all straight to the source. Check out Steve's book. Where did Contact Sheet II go? Click here to get Contact Sheet II for CS4 (Windows), and a bunch of other goodies. (Mac users can click here) I'm not sure why these were deleted, but there's been enough complaining that Adobe's put the gear together as a download. Many times, we generate thousands of image files per case. Some, in an effort to squeeze as much file space out of their aging hard drives, compress their folders into Zip files. This habit can lead to issues when building PDF portfolios ... as this blog post illustrates. A simple work around ... unzip the folder ... then dump the folder into the Portfolio. These are the comments that greeted Dave Helmly's announcement that Premiere Pro CS4 now supports .VOB file editing (with the 4.1 update). Yes, you read that right, you can now work directly from non-encrypted DVDs in Premiere Pro CS4. Some field personnel are using DVD recorders to capture the CVBS output from a DVR when all else fails - no other output options and imaging the HDD is not a viable option. Others use video cameras that record straight to DVD. Now, you can work with these DVDs in Premiere Pro. How cool is that? It's been a long time in coming ... and I sure am glad that the time is now. Having their pictures posted on Facebook while partying with friends may not seem like a big deal to many college students. But for a Campton Hills woman charged in a DUI-related fatal crash, those pictures had serious consequences. Under orders from a Kane County judge, Erika Scoliere, 20, was outfitted Thursday with an alcohol-monitoring ankle bracelet after police found online photos of her consuming alcohol on Facebook. I recently sent some files to a friend. In the PC world, you just "zip" them up and send them off. In the Mac world, you "stuff" them. My friend with the PC hadn't seen the .sitx file extension before. So I sent the link to the free Stuffit Expander for PC. Mac users know Stuffit. I've used it for years. The latest updates to the software make it even better. I'm a big fan of both Stuffit and TechTool, and now I can get them in a bundle. Pretty cool. SmithMicro throws in the other pieces to sweeten the deal. Spring Cleaning, with its digital shredder, is handy, but the others are rendered useless by my use of Apple's TimeMachine and MobileMe. Still and all, it's a decent and convenient bundle. I just wish that the bundle included TechTool 5 Pro. Wishful thinking, considering that TechTool 5 Pro is a dollar cheaper than the bundle. I saw a feature on Life Magazine's web site on newly discovered pictures of Adolf Hitler that show a more personal side of his life. As I viewed the pictures, I couldn't help but think that they would have benefitted from a better restoration - bringing more of the details and the colours out of these images. The photographer, Hugo Jaeger, has a good eye and the images themselves are beautiful - in spite of the subject matter. I just wish that they weren't so flat (but that's not Hugo's fault). Check it out and see what I mean. A reader writes in to ask a question, "what's Rosetta?" He was attempting to use some older plug-ins and the manufacturer recommended opening Photoshop in Rosetta. Rosetta is an emulation mode meant to facilitate the transition from the older PowerPC Macs to the new Intel based Macs. It's a Mac-only issue. Plug-ins that require you to run in Rosetta haven't been updated to run "native" on Intel based Macs. 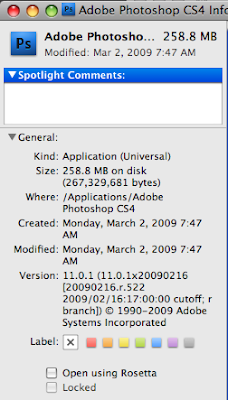 Running Photoshop in Rosetta is slower, so I don't recommend using this unless you absolutely have to. The issue, again, mainly affects older products. If you've bought a new Intel based Mac and have new versions of Photoshop and your plug-ins, then you shouldn't have to worry at all about Rosetta. For those that missed the last round of Acrobat eSeminars, the summer is here and there have been some new dates posted. Check it out by clicking here. There's a seminar on creating forms and one on portfolios, plus much more. There are a few law enforcement folks out there using Final Cut to work with video. One of the problems that they've had is sharing their results with the rest of the community - be it for peer review or in the discovery process (Mac vs. PC discussion notwithstanding). In Premiere Pro CS4's latest update, you can now import Final Cut projects directly and work with them as if they were created in Premiere Pro, with no conversion or rendering necessary. For more information on this exciting development, check out Dave Helmly's video on AdobeTV by clicking here.